Two hundred years after her death on July 18, 1817, Jane Austen and her novels are now more beloved than ever before. Much the same phenomenon holds true for Charlotte Brontë and for Virginia Woolf. It’s probably less true for George Eliot whose novels, including Silas Marner: The Weaver of Raveloe, were once required reading in American high schools. A Secret Sisterhood: The Literary Friendships of Jane Austen, Charlotte Bronte, George Eliot and Virginia Woolf shows that sisterhood is indeed a powerful force in the world of letters, and that women writers who have created powerful women characters—like Jane Eyre and Mrs. Dalloway—have reached readers all over the world. In hindsight, it’s hard to understand why teachers once expected teenagers to hunker down with Silas Marner. On the other hand, it’s not hard to understand the popularity of “the tribe of scribbling writers”—to borrow the phrase that Nathaniel Hawthorne used to dismiss women writers of the mid-19th century. The scribblers found success by cultivating sentimentality and ensuring happy endings. The literary geniuses paved their own way, even as the feminism of the late nineteenth century, and feminists like Mary Wollstonecraft—mother of Mary Shelley of Frankenstein fame—helped to prepare the ground for their coming. The novelist, short story writer, critic, and feminist, Margaret Atwood has written a trenchant Foreword for A Secret Sisterhood. Indeed, Atwood explains that the male literary world often regarded women writers as “reclusive, tormented, neurotic and even morbid.” Men with pens and typewriters have been as neurotic as any women in the literary field; indeed their neuroses are said to fuel their genius. Alas, some of the popular women writers of the 19th century weren’t much more than “scribblers.” At about the same time that Hawthorne dismissed lady authors, George Eliot—born Mary Ann Evans—wrote a provocative essay titled "Silly Novels by Lady Novelists." Eliot noted astutely that men praised the merely talented women writers and simply ignored the women writers who were geniuses. George Eliot, the literary genius at the heart of A Secret Sisterhood, didn’t have Austen and the Brontës in mind when she wrote her provocative essay. Indeed, there’s nothing “silly” about Pride and Prejudice, Jane Eyre and Middlemarch, George Eliot’s towering masterpiece about outliers in mid-19th century British provincial society. Nor is there anything “silly” about Mrs. Dalloway and To the Light House, or about Virginia Woolf herself who wrote famously "A woman must have money and a room of her own if she is to write fiction.” Money and a room, preferably with a view, certainly help, though Austen and the Brontë sisters wrote works of genius despite their modest circumstances. Emily Midorikawa and Emma Claire Sweeney, the authors of A Secret Sisterhood, both have first names redolent of Victorian England. As friends, fellow teachers and kindred scholars, they carry the torch of feminist cultural criticism. Meticulous researchers, they leave no manuscript unturned. They also have a healthy skepticism about the official story crafted by the bad boys of the patriarchy in order to keep the literary laurels for themselves. 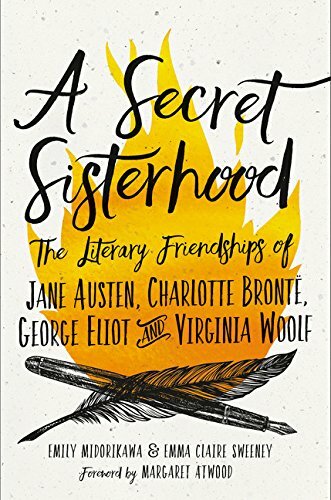 A Secret Sisterhood tells stories about literary friendships that went beyond class boundaries (Jane Austen) and that transcended geographical distances (Charlotte Brontë and George Eliot). Still, the literary sisters weren’t always sisterly. Sometimes jealousy and envy reared their heads. Few male critics have been as caustic and few have written about Pride and Prejudice as brilliantly as Charlotte Brontë. Yes, the sisters could be catty, as Atwood warns readers in her Foreword. “There were cooling periods, perceived slights, hurt feelings and silences,” she writes. Tillie Olsen explored some of that same territory in Silences (1978), her pioneering work of cultural criticism, that traces the ways that working class women and men, too, have been stymied creatively. Atwood lauded Olsen’s book in a dazzling review in The New York Times when it first appeared in print nearly 40 years ago. There are more secret sisterhoods in the world of letters than Midorikawa and Sweeney allow, though they hint at some of them in their Epilogue, “A Web of Literary Connections,” in which they mention the friendship between Zora Neale Hurston and Marjorie Kinnan Rawlings that transcended skin color, and that took place in the segregated American South. Sometimes Midorikawa and Sweeney seem to erect straw men, as when they write, “well into the twentieth century the creative relationships of male writers still overshadowed those between women.” In part, that’s true. The friendship between F. Scott Fitzgerald and Ernest Hemingway was legendary even before Fitzgerald died in 1940 at the age of 40. But Gertrude Stein and Alice B. Toklas were also legendary figures and cultural icons. Djuna Barnes and Thelma Wood carried on famously in Paris, even as they produced creative work. Novelist Willa Cather and magazine editor Edith Lewis lived together as friends and lovers for 39 years. Women writers refused to be overshadowed. Still, now that A Secret Sisterhood is in print it will be even more difficult than ever before for critics and biographers, male or female, to dismiss, ignore or bury the friendships that literary women have enjoyed. And that’s worth cheering!